Martin Davison Public Relations, (MDPR) the public relations affiliate of The Martin Group, a leading integrated communications firm headquartered in downtown Buffalo, NY with an office in Rochester, NY, today announced 31 awards as part of the PRSA Buffalo Niagara’s Excalibur Awards. 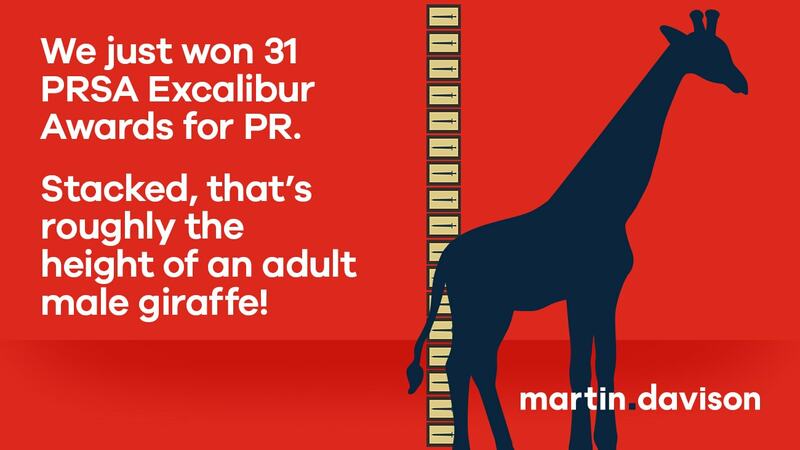 MDPR cites the combined length of the awards as the same size as the estimated height of an adult male giraffe. In its 28th year, the PRSA Buffalo Niagara Excalibur Awards honor outstanding public relations work, professionals, and students in the Buffalo Niagara region. Learn more about PRSA Buffalo Niagara Chapter.